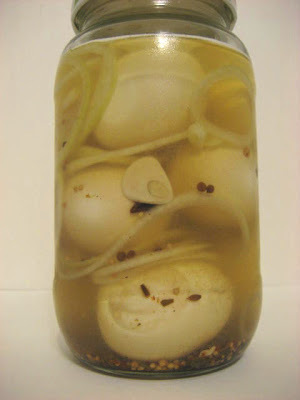 Pickled eggs are almost a necessity for preparing snacks, sandwiches, potato salads, or any salad for that matter. I t is hard to imagine any celebration table without a food that doesn't include at least one dish that has hard boiled or pickled egg in it . Use older eggs, they will be much easier to peel; very fresh eggs do not have a membrane between shell and whites. Easy and foolproof test for freshness is to drop egg in a tall glass full of water. Fresh egg will lay down on its side on the bottom, older egg’s pointed end will rise. Place eggs in a pot and cover with about 3” of cold water above the eggs. Bring to boil, cover, turn off the heat and let stand for 8 minutes. Drain and cool immediately under cold running water, peel and set aside. Boil rest of ingredients for 5 minutes, add sliced onions and let cool before pouring over eggs. Keep refrigerated. Those eggs get you out of any hunger pain in a jiffy. They are the best for making a healthy snack in few minutes. This post should include how to use them for preparing a fast and delicious hors d'oeuvre. They can be kept in the fridge for a long time and just get better with time. Ymmmmmmmmmmmmmm so good.